We present a detailed NMR study of the insulator-to-metal transition induced by an applied pressure p in the A15 phase of Cs3C60. 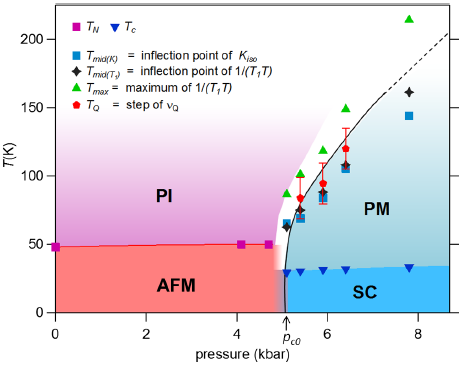 We evidence that the insulating antiferromagnetic (AFM) and superconducting (SC) phases coexist only in a narrow p range. At fixed p, in the metallic state above the SC transition Tc, the 133Cs and 13C NMR spin-lattice relaxation data are seemingly governed by a pseudogaplike feature. We prove that this feature, also seen in the 133Cs NMR shift data, is rather a signature of the Mott transition which broadens and smears out progressively for increasing (p, T). The analysis of the variation of the quadrupole splitting νQ of the 133Cs NMR spectrum precludes any cell symmetry change at the Mott transition and only monitors a weak variation of the lattice parameter. These results open an opportunity to consider theoretically the Mott transition in a multiorbital three-dimensional system well beyond its critical point. This entry was posted in Fullerenes, Superconductivity. Bookmark the permalink.